If you read our publications, you likely already know about George Tuska, one of the most prolific artists of the Golden and Silver Ages. 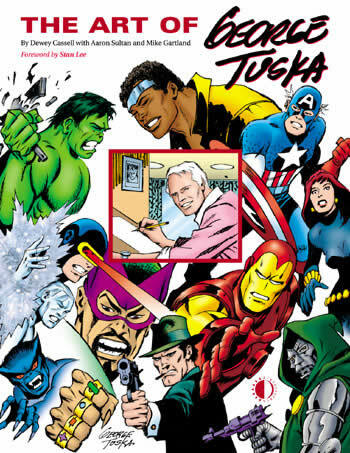 He died last October at the age of 93, but we were honored to produce the first career-spanning book on George and his life, titled The Art of George Tuska (by Dewey Cassell, with help from Aaron Sultan and Mike Gartland). The book features a Foreword by Stan Lee, and is chockful of great Tuska art, as well as a career-encompassing interview. 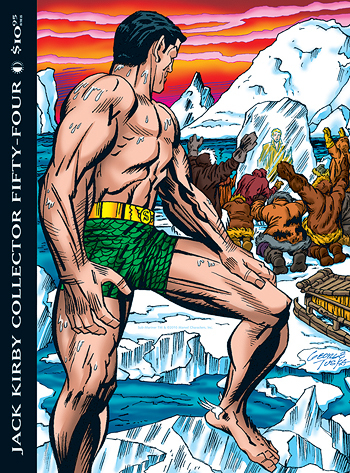 And if you’re a Tuska fan, keep your eyes peeled for Jack Kirby Collector #54, which’ll FINALLY be shipping (if I get my can in gear over the next week and complete it) on March 5. It not only features George’s final (albeit brief) interview (conducted by his good friend Mike Gartland), but I’m going to totally mess with our distributors, retailers, and customers, and pull a last-minute switch of cover art—taking the Kirby/Tuska collaboration that I’d planned for the BACK cover of that issue, and moving it to the FRONT cover as a long overdue tribute to Mr. Tuska, and a nod to Mike Gartland, who (as you’ll see in that issue) really busts my chops for not featuring George’s work on a TJKC cover while he was still with us. New cover art is below! This entry was posted in TNT on 21 January 2010 by Mr. Morrow.